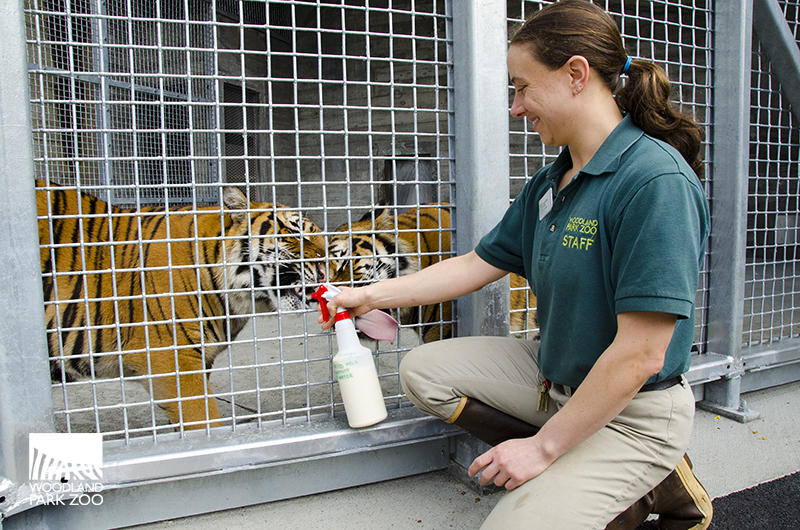 Woodland Park Zoo Blog: What is it like to be a tiger keeper? Christine Anne is the Lead Keeper at Woodland Park Zoo’s East Team carnivore unit. Christine has been at Woodland Park Zoo for just two years, but she has been a keeper for over 13 years. Prior to working in Seattle she worked at San Diego Zoo Safari Park as the head lion keeper, as a bear manager at a brown bear rescue center in Sitka, Alaska, and as Assistant Supervisor of Carnivores at Wildlife Safari Park in Winston, Oregon. Her expertise in working with big cats is instrumental to the zoo, especially with three young, energetic new residents—the tiger brothers of Banyan Wilds. So, what is it really like to work with Liem, Eko and Olan? 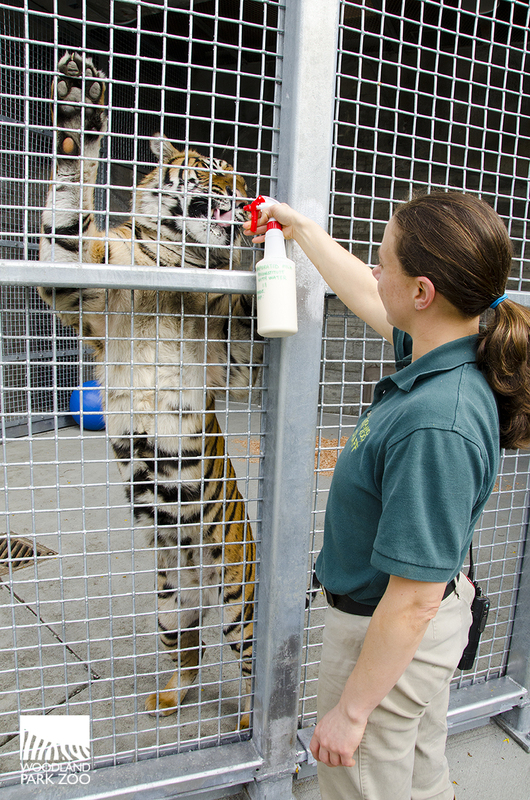 Christine treats a tiger to a spray of milk, a reward for working with keepers to practice health checks. By asking the tigers to stand up, keepers can easily check their paws, belly and mouth. Photo by Ryan Hawk/Woodland Park Zoo. We asked Christine to give us the inside scoop on the tigers and what it’s like to work up close to these big cats! Do you wear any special clothing? The green Woodland Park Zoo uniform and a good pair of waterproof rubber boots or hiking boots on hot days. What is the first thing you do when you arrive at the zoo? I visually check all the animals in my area to make sure they are well. What are the tigers usually doing when you arrive in the morning? No surprise, they are sleeping! Do they all sleep in the same spot behind the scenes? No, they just seem to randomly pick a spot that seems nice and sleep there. Sometimes they sleep together in a pile of two or three; sometimes they sleep separate from each other. It all really depends on their mood at the time. Do they make any noise in the morning? Since these tigers are still young they make many noises that we wouldn’t normally expect to hear from an adult tiger. They make a low moaning sound, a squeaking sound, and they chuff at each other and at the keepers as a friendly greeting. When it comes time for feeding, it is all business with them, and that’s when the tiger comes out. They growl, hiss, and roar. Once the food is gone they are back to their calm selves again. What do the tigers eat for breakfast? Usually they eat a ground beef zoo diet specially formulated for carnivores. Different days of the week they may receive beef bones, whole dead rabbits, or whole dead chickens similar to what we would buy at the grocery store for ourselves. When the tigers enter the exhibit, what do they usually do first? The tigers go out on exhibit at 9:30 a.m. Their first order of business is searching the exhibit for enrichment that had been placed out there by keepers. Christine worked behind the scenes with the young cubs when they first arrived to Seattle. Getting to know and engage their new keepers made adapting to their new home a smooth transition. Photo by Ryan Hawk/Woodland Park Zoo. What does the rest of your morning consist of? The morning consists of preparing diets, shifting animals into holding for feeding and to access the exhibit for cleaning, and then cleaning the holding areas. Besides tigers, how many other animals do you work with? Anywhere from 16 to 32! I work with lions, tigers, warthogs, meerkats, keas, tree shrews, Indian flying fox, springhaas, two-toed sloth, tamandua, sloth bears, patas monkeys, and Asian small-clawed otters! 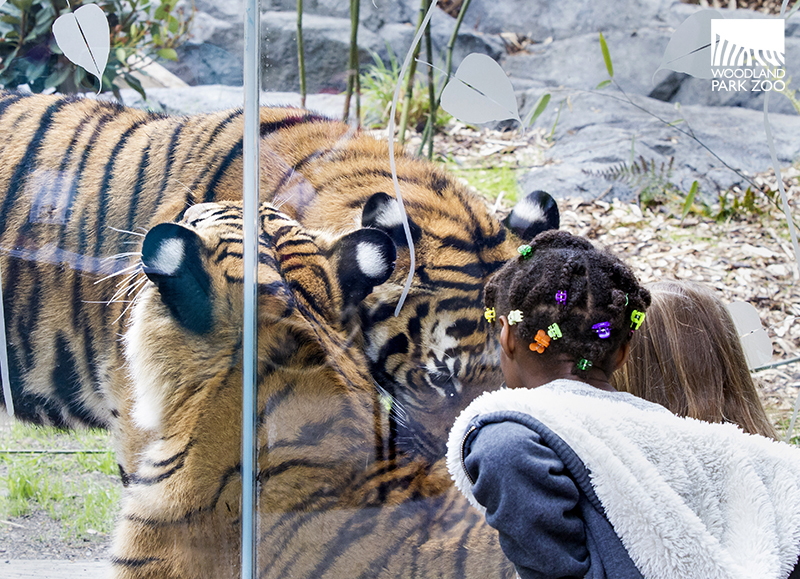 Zoo guests get a face full of tiger stripes at the up-close viewing window. Photo by Dennis Dow/Woodland Park Zoo. Do you work with people too? I do. I work closely with other keepers in my units, managers, veterinary staff, and education staff. Do the tigers have a distinct smell? Yes, this smell is hard to describe, but it is a stronger smell than the lions have, and as these young tigers mature, the smell will change and increase in potency. How do you spend your afternoon? The afternoon consists of feedings and animal training as well as enrichment projects. Malayan tiger, Liem, keeping his stripes clean. Photo by Dennis Dow/Woodland Park Zoo. Do the tigers have favorite treats? They really enjoy their hard boiled eggs and bones, as well as blood-cicles. Olan prefers milk, Eko loves chewing on bones and Liem loves hard boiled eggs! What are some personality traits or behaviors that are unique to each tiger? Olan is usually more curious about keepers and the exhibit. Eko is more nervous about new things and people around him. Liem really likes enrichment and chasing his brothers. Are the tigers trained to respond to their names? If so, how did you achieve this? They learned their names from a very young age at Little Rock Zoo. Once the names were selected keepers spent a lot of time using the names with each individual cat and rewarding them for responding to their names. We positively reinforce this name recognition every day with them as well. How is working with tigers different than working with lions? Lions are social animals and their pride structure can make them more accepting of keepers and changes in their exhibits. Tigers have a tendency to be more cautious of their environment. 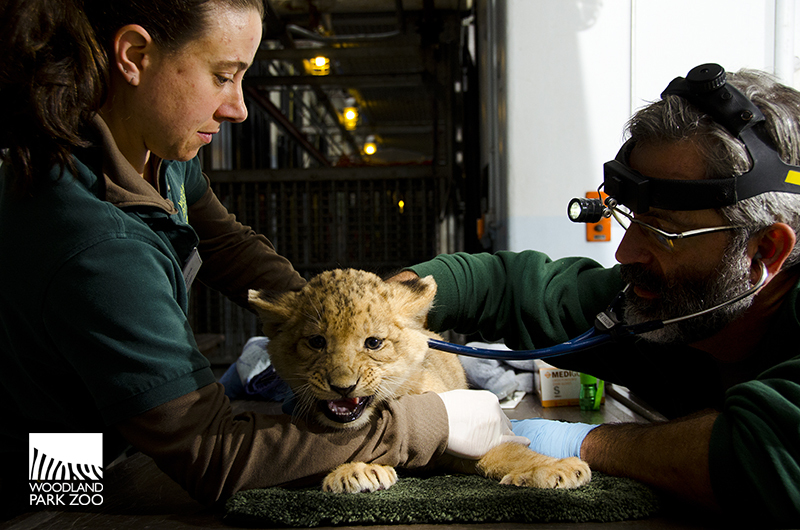 Christine Anne soothes a lion cub at one of his first check ups. Christine knows cats, big and small, and is a key member of the feline animal care program. Photo by Ryan Hawk/Woodland Park Zoo. Will our tigers always be able to share the same space or will they need to be separated as they mature? At some point the tigers will let us know when they are no longer interested in cohabitating together. This is most likely to occur upon sexual maturity, but sexual maturity is not the only factor. Keepers make behavioral observations in order to determine if the tigers are still compatible. The tigers will let the keepers know when they are ready to be on their own. Does one tiger seem to be the alpha? No, this is very fluid in a group of young tigers. One may display dominant behaviors one moment, and then another tiger may display dominance in another moment. What is the most challenging part of your routine? No day is ever the same. There is a general routine but the animals are different every day, so each day is different. What is something you've learned by working so closely with tigers? Learn more about our three tiger boys by visiting our new exhibit, Banyan Wilds, and get up close to these massive cats! The best time to see the tigers is earlier in the day before their cat naps. Make sure you check out the 9:45 a.m. daily enrichment (except Tuesdays) or the mostawesome Tiger Gate Experience at 2:00 p.m. daily (except Tuesdays) where you can get really close to the tigers and watch as keepers engage the big cats through a safety gate to perform health checks. 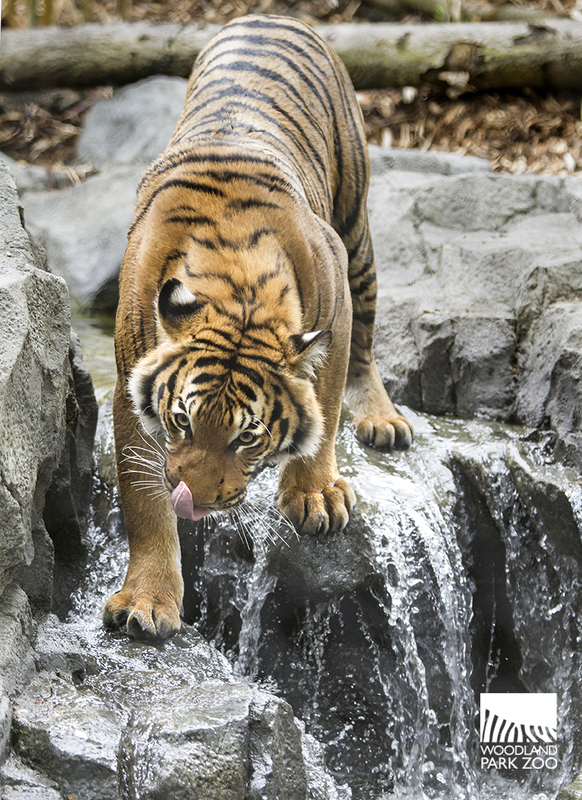 Eko cools off in the tiger stream. Photo by Dennis Dow/Woodland Park Zoo.